Better animals without the bells and whistles! Have you ever looked at the common pigs, chickens, cows, etc, then looked at the horse? You may have noticed a clear difference in design, and how much better the horse looked. As you know, something similar happened in 1.13, but in reverse. So the question is, why make the horse worse when you could make the other animals better? This mod aims to do just that. 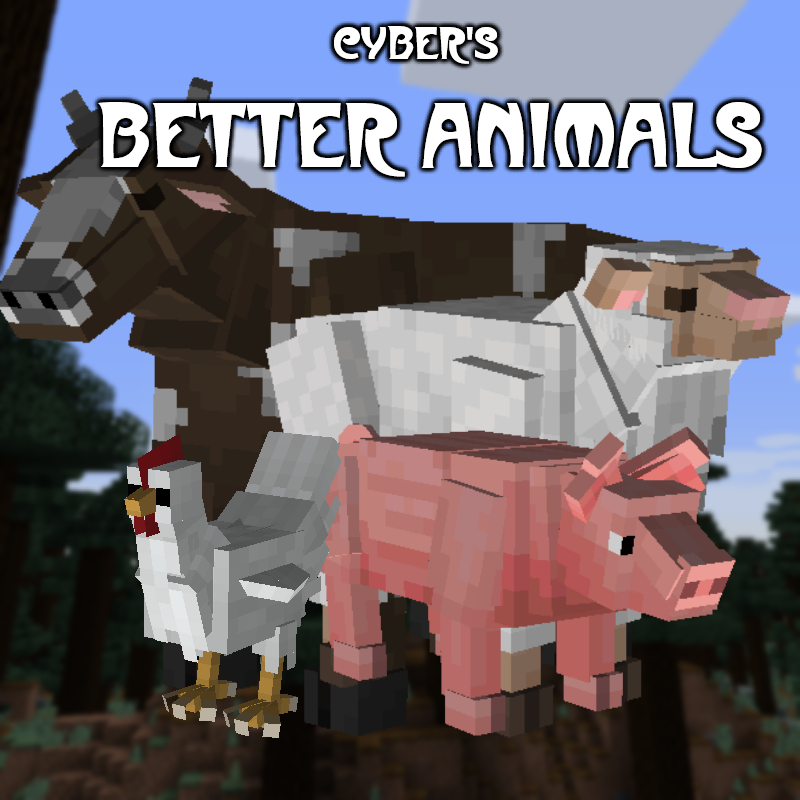 This mod is very simple in its goal--better animal models but without adding genders, breeds, special care, etc., as some of us simply want the vanilla animals to look a bit better. Better models for all "animal" like mobs, both hostile and friendly. There is also a config to disable and enable select models being replaced. NOTE: As of version 2.0, BA no longer replaces vanilla animals with its own mobs, instead simply overwriting their models. This means updating from any pre-2.0 version will make you lose your animals. Feel free to post any suggestions, ideas, tweaks, down below. Yes, this mod can be included in any modpack, as long as the modpack is distributed for free and credit is given. The assets (textures, models) in Better Animals Models are reserved to Cybercat5555, and cannot be reused or recreated without permission, unless within fair use. Location: Somewhere in Time and Space. Pretty good, but I have 1 issue and one request. I cant breed any of the animals together. I click them with wheat and it doesn't work. Also could you put proper teats on the cows? I know they are on the texture but the cows kinda look off without them. There is no Mooshroom spawn on mushroom island. Only normal cows. i think it is a bug. Thanks! By the way, Can you make the cave spider's model smaller? The hit box of cave spider is the same as vanilla, but the model of them as big as normal spiders. Mod works fine in singleplayer within my modpack. Im also able to use it in multiplayer, installed client and serverside (both forge). When I start my multiplayer world it kinda doubles every single entity which is including in your mod which pretty much leads to a server crash if I dont kill every re-modeld mob immediately. If I uninstall the mod serverside but leave the clientside one installed Im still able to join the server and the new mobs are loading but it laggs like hell and is unplayable. I noticed another issue. sometime while building, I come across small random areas where I can't place any blocks. reloading the game without this mod, lets me place blocks there again. They were just 2x4 or 2x1 patches in which if I place a block, it immediately disappears. I also have the issue in which there are far too many mobs. I have started getting massive groups of animals, sometimes hundreds. and I don't have any millenaire village mods or anything like that installed. I'm pretty sure it's this mod that's spawning too many. Hi, I have a few compatibility requests. I was wondering if there'd be interest most especially in compatibility with Improving Minecraft mod? It would also be great to see compatibility with Better Agriculture, if at all possible? Im playing on 1.10.2; if these compatabilities are of interest, ill be hoping for that version :) . I found a bug with breeding sheeps, if 2 sheeps with colored wool breed they produce little sheep with white wool, also i had lots of colored wool sheeps in world and after i installed this mod they all got white wool. For some unknown reason, the mod causes very strong lags in the game, on the server. why are there no config options for this mod? options to get regular chickens, since you have to be able to get them for the angel ring from extra utilities. After much testing, I have found that your mod is causing an issue with the log, I get random numbers, lots of them, the log maxes out at 10000 lines and it goes over that, and stops logging, I have reverted to version 1.1 1.12.2 since it's not happening in that version. Really, if the mod works on version 1.12.2, it will not work on version 1.12? I mean, if you register the support for this version in the mod code. Would you please set up a github for the mod so we can report bugs properly? after 1.13, could u make a client side mod that does this to the horse model again, basically reverting it, but unlike this mod, client only. basically, a mod that functions like a resource pack but is a mod bc its easier to make 3d models with mods than packs. Did you make the animals auto breed? Because I had a little farm of each type of animal and after installing the mod the farm grew up a lot and now Im full of animals everywhere, even my nether is full of chickens. This was probably a problem with your mod and the Hatchery mod, since your mod is detecting all chickens from Hatchery as BA Chikens. Please solve the issue so I can re install your nice mod. Thanks.